The big picture is clear: Netflix is growing fast, domestically and even more internationally. Let’s look at the next level of detail: user addition vs marketing spend. That is essentially what customer acquisition cost is about. Though, as you will see in a moment, there are different versions of such calculation. But the question remains: how do we know what is good and what is bad. Was 2018 still a good year or was it already bad? And how good or how bad are things? That is what the metrics we are covering today try to help answer. The user-related metrics that we are covering here are trying to give us a forward view of how our efforts to attract users fare. At what cost are we attracting users and how much revenues do the users generate on our business? Was it worth attracting the customers at this cost? but here is a stupid question: what is a new customer? There were some years where this formula was off by a few percent. But by and large, it is quite accurate, esp in recent years within 1% of the reported numbers. Dividing CAC by ARPU gives you the time period in which you recoup your customer acquisition costs. If you are measuring your ARPU per months, this calculation tells you how many months of revenues you require from a user to pay for attracting a user. 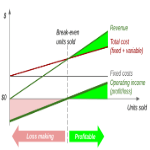 But this is not the same as break even (given ARPU is revenue, not profit). Churn is basically the leak at the bottom of your bucket. It is how many people leave (and potentially rejoin and re-leave) your subscription. Some companies build switching barriers to make this difficult. Netflix makes it very easy. People can cancel anytime without providing reasons. There will be people who join for a month, binge watch a number of series and then leave. Netflix takes up this challenge and tries to keep people on their screens. Netflix has published annual churn rates only for a very short period 2008-2009. And their churn rates were excellent at 4.2%. From 2010, we have to use analyst estimates. One such analyst estimates Netflix churn rate to be an annualised 9.7% for 2018. (9% in 2016, 19% for Amazon Prime and 20% average for OTTs) Same analysts think this was an increase of 1.9% (quarter-on-quarter, Q2-Q3 ’17) following a price increase of 10% that Netflix introduced in 2017. 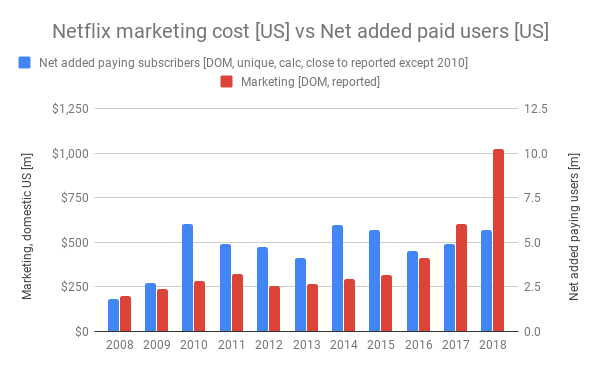 /1/ Calculated as number of paying subscribers 2018 minus the same number in 2017. Note, the CAC of $94 applies to the US domestic segment. For the international segment, this is much lower at $43 and combined it is $56 (though the combined figure makes little sense given both businesses are at vastly different stages in the maturity curve). 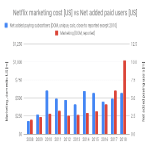 So, on average a new customer costs Netflix $94 to attract. Is this good or bad? A first hint comes from the number of monthly revenues that this equates to. In this case: 8.3 months of revenues (with average monthly user revenues sitting at $11.4). But we need also know how long a user sticks with us. Say the user typically stayed around 6 months, then our CAC would be too high. If the user stayed for 30 months, things look better. But then we still need to look further. Say the user sticks 30 months (this is the average across OTT services) with us but CAC takes 50 months worth of profits then we are still on a slippery slope. So, these are the things we are going to look at now. The second formula is the one that you will typically find in other sources. But it is important to recognise that you may need to add more than the cost of revenue. I will elaborate on this in a moment. Let’s get the simple version done first. Of course, you need to use the same time period for all of the above numbers. I suggest you use annual figures. Companies like Uber, Lyft, Netflix, Airbnb and many other spectacular start-ups use investor money to pay for the customer acquisition cost. However, that money does not come for free. We need to factor in the cost of that investor money (or any cost of capital for that matter). The most commonly used metric in this context is called Weighted Average Cost of Capital (WACC). Netflix’s WACC is calculated to be 11.9%. Now, this is a rather technical calculation (you can see this from it varying between 6.4%-16.4% over just the last 5 years). Given Netflix is very attractive for investors I will simply assume 8%. The formula is not intuitive but there is an explanation how a long stream of discounted future cashflows from retained customers converges to the above static formula. This LTV will be much lower than what you get in formula (3) (bummer, eh?). In this case, $299 in 2018. (If you don’t believe the above formula is correct, just do the calculation, say, for the next ten years individually (apply the churn rate and discount rate for each year in escalating fashion) and add them up … and, voila, you will end up very close to the above formula). The ratio of your Customer Lifetime Value (CLV or LTV) to your Customer Acquisition Cost (CAC) will give you an indication if you are on the right track or not. Comparing the two numbers is a start but looking at the ratio is more helpful. A ratio >5 is considered very good. Looking at such a high ratio helps to accommodate for limitations of any metric as such. 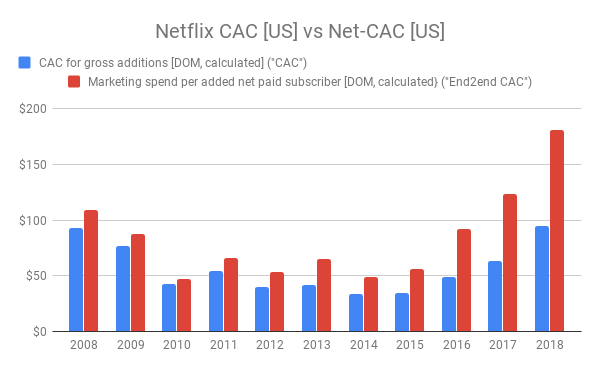 One may be tempted to calculate LTV/CAC[End2end] but the problem with that is that we would penalise Netflix twice for the churn rate. However, we could argue that some of the other costs should be also accounted for in these calculations. Let’s look at that next. You can account some portion of the Technology & Development (T&D) costs to either acquisition (i.e. the CAC) or retention (i.e. the LTV). Why? Because some share of the T&D costs are being incurred to make the offering more attractive. And the purpose of that is to attract / retain customers. Some of the costs are for the international expansion – well that could be part of the acquisition cost. The other case for such considerations is that the technical features determine different pricing (i.e. 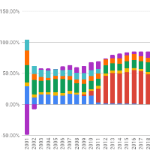 revenue per user). 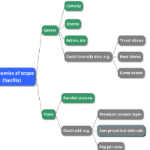 Look at Netflix’s plans and you will see that they are mainly distinguished by technical features. 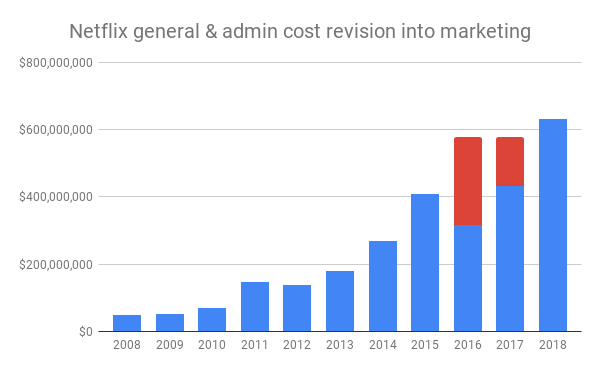 Allocating costs to CAC means you increase these costs by the allocated amount. Allocating costs to LTV means you reduce the profit per customer by a respective amount per user. I would e.g. allocate T&D costs to the four buckets as such: 10%, 30%, 40%, 20%. This is a guess. If you do this for your own innovation you will have enough data to make this better than a guess. And note, that you may not have to allocate all costs. You could allocate some of this to pure maintenance or upkeep with technology developments. If you allocated 40% of T&D costs to the US domestic business then LTV/CAC changes from 7 to 6. You could do the same with content costs. They are fully accounted for retention (thus LTV) by virtue of the fact that they are fully included in the costs of revenue. You can back out some portion of it and allocate it to CAC (e.g. the cost of the marquee shows – we know Amazon Prime TV looks at such a metric called cost per first stream). It’s not always easy to allocate costs correctly. Even for the company itself. Here is a remarkable example of how >$250m were miscategorised in 2016. To me, the lesson here is to use formula (1) and identify all costs involved in customer acquisition regardless of what they are called in the headline. I hope our real-world examples help you to understand the crucial metrics better than just throwing formulas at you and inform you of your choices as an innovator. Why are we doing all of this? Because it can help make the best decisions for your innovation. With this, we are one step closer to seeing the full picture on Netflix. Stay tuned next time when we continue on this journey!